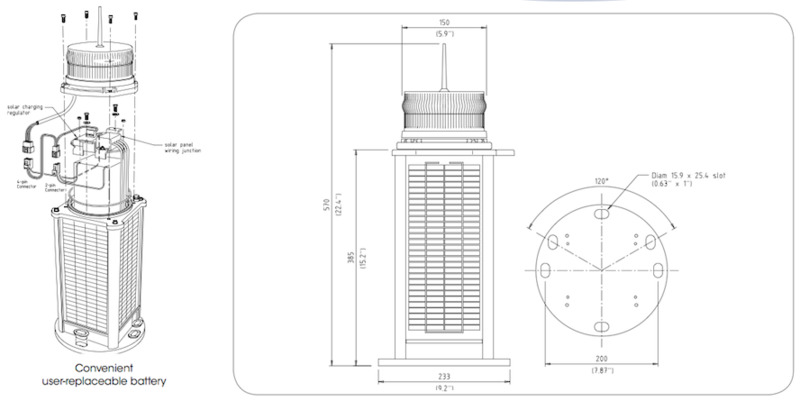 Solar Powered Wind Turbine Obstruction Light FAA Solar Powered Wind Turbine Obstruction Lighting robust, completely self-contained LED light designed for a range of emergency aviation applications including runway, threshold, approach, helipad and tactical airfield lighting. 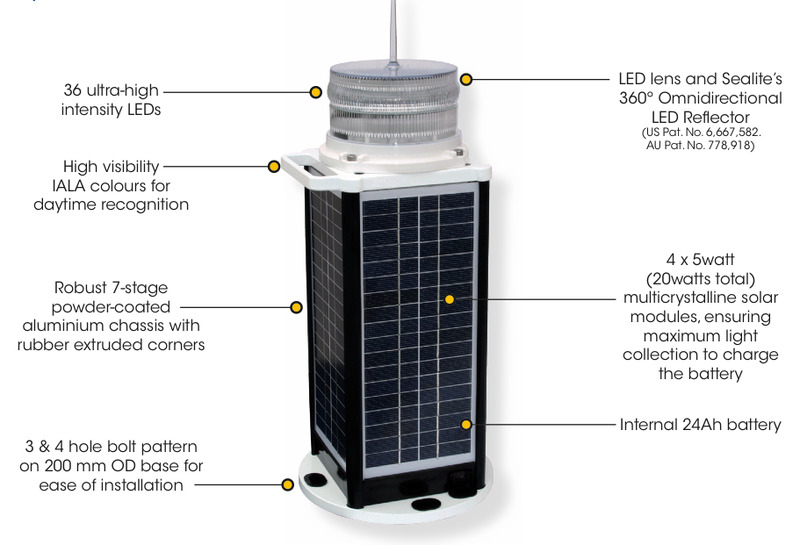 Fitted with RF radio control, this fully functioning light can be controlled from the tower with no costly cabling or trenching required. The unit is made from cast aluminum, subject to 7-stage powder-coating in aviation yellow. Four premium grade solar modules are integrated into the assembly and mounted to collect sunlight at all angles. The solar array charges the 24Ah battery during daylight hours, and at dusk the light will automatically begin operation. 16 independently controlled LED drivers within the light optic (patents pending) allow the IQAV425-RF fixture to operate as an omnidirectional or bi-directional assembly designed to meet the photometric requirements of FAA L861 runway edge and threshold when set to temporary high mode. The IQAV425-RF has non-precision IFR and VFR capability with both visible and near infrared lighting outputs. The airfield lights can be controlled anywhere in the airfield by handheld radio controller or in the air traffic control tower with virtually unlimited range using an encrypted repeating mesh network. The IQAV425-RF wireless RF light has a practically unlimited range through the use of the AvMesh™ communication network.The proprietary AvMesh™ network enables each light to transmit and receive commands, allowing the airfield to be expanded or altered at any time. AvMesh™ is self-realizing, meaning once deployed the airfield lights will undertake a period of network mapping, whereby the system automatically determines an efficient path to relay command messages through the airfield. This means that unlike competing products, the IQAV425-RF does not require direct line of sight to the handheld controller. The main requirement is that the distance between the controller and the closest light in the AvMesh™ network is no greater than 1.4km, and no two lights are more than 1.4km apart. AvMesh™has redundancy. Once the system has mapped an efficient relay of command messages, a secondary sub-network is mapped for added redundancy. 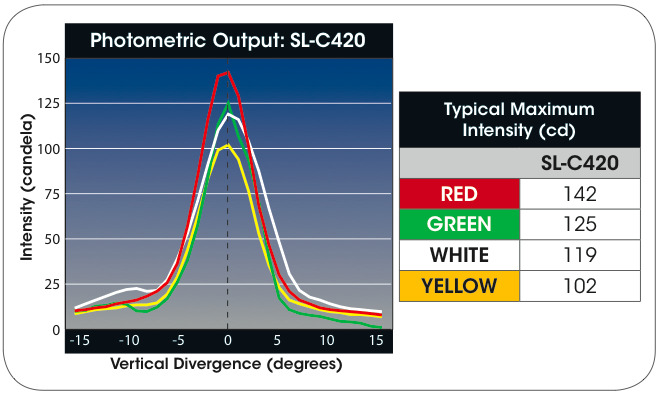 The IQAV425-RF has three selectable modes; always on, dusk-till-dawn and standby. When set to dusk-till-dawn mode, integrated sensors in the light are able to detect when the ambient light threshold drops sufficiently and the light will begin operation automatically. Light intensities can be set to Low (10%), Medium (30%), High (100%). Lights are able to be assigned to a ‘light group’, and groups can be controlled independently using the wireless handheld controller. Sequenced approach can also be easily set up via the serial port and controller/PC interface. Tested to MIL-STD’s for environmental exposure including shock and vibration, extreme temperature and humidity, the unit is designed to offer years of maintenance-free service and operate in some of the world’s harshest environments. The IQAV425 is also available without RF radio control (AV425). To suit localised standards, the AV425-RF can be supplied with optic head designed to comply with either FAA L861 or ICAO Annex 14 photometrics. Pilot Activated Lighting Control RF Radio Control Activated Lighting controller Users are able to directly control the operation of a singular or groups of airfield lights.